The Vic had to go into the shop a couple of times over the last few days, which threw my life off kilter. The Vic's shop is way out on Transit in Amherst and for me it is like going to Ohio. I used to go there several years ago because Howard had an apartment on Transit, back before he married me, when his life was suburban Perfectville. Boy, did that change! Now I am just not used to going to Transit any more. But in a way it was kind of fun because I ended up mixing up my routine a little, going places I normally do not go. The first time the car went in I took the opportunity to hit a Zumba class out at the Eastern Hills Buffalo Athletic Club. I never go to that club. So it was a different teacher, different gym, different class, different classmates to gab with in the locker room afterwards. I normally like going to the downtown BAC, the flagship gym, the gym where Pennario used to go. But it is sort of fun to go to a different gym where you do not know your way around. The second time the car went in was on Saturday and they told me six hours. Six hours! Zut alors! But my mom drove in and met me. We went shopping and then we went to Chili's for lunch. And then we went to T.J. Maxx and shopped some more. My mom was driving us around which was funny for me because usually I am the one driving us around. So that mixed up my life a little bit more. I never go there! It was garbage food -- the chicken tacos ended up being this fried crunchy chicken. I mean, who ever thinks of that? It had said "crunchy" on the menu but I am naive and I was just thinking they meant it had crunchy lettuce or carrots in there or something. You really have to order defensively, you know? The world just throws all this crud at you. But still. We had fun. We were sitting around laughing about stuff. The staff at Chili's is really nice, is another thing. 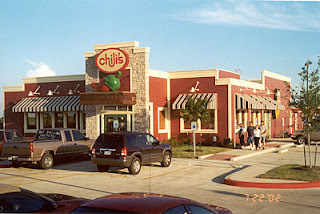 They actually have guys waiting at the door to hold the door open and say "Welcome to Chili's," and say goodbye to you when you leave. Unusual, that. On top of that my car was done three hours ahead of schedule. Howard was mad because it turned out they had not done everything to it that he had asked them to. But you know what, that is what happens when he makes me take care of stuff like this myself. It will not be perfect. The important thing is, I am done for now with going to Transit Road.